The BPMH residential complex consists of seven one and two bedroom cottages, six two and three bedroom apartment units, and two large homes, one of which houses five single residents in a shared housing environment. The spacious living room of this home, called House A, is often used for meetings and community gatherings. The second home, The Bill Ng House, (also called the Guest House) is used for Morning Prayer, Board Meetings, and small group meetings of the community. There are two large guest bedrooms upstairs available for inexpensive short stays for visitors and guests of residents, seminary visitors, members of congregations, visiting professors and mission-co-workers. The Executive Director’s office is also located in the Bill Ng House. The Mission Homes are set in well-maintained gardens with a fenced playground for small children. There is off-street parking for one car per residential unit. There is a common laundry facility. Units can be furnished upon request and may include linens and kitchen equipment. Rental fees include water and garbage. Gas is paid for the 6 apartments only. PG&E for the Cottages is paid by the residents. Internet access is spotty on the campus, and therefore some residents prefer to have their own internet installed with Comcast or AT&T. Telephone service is at the tenant’s expense. 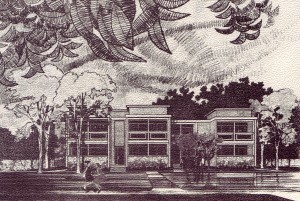 The Mission Homes were established in 1937 through the foresight and generosity of Carolyn Babcock Adams and her family. The Adams family served as missionaries in Korea for two generations, conducting evangelistic work at the newly established station of Taegu. Caroline Babcock, the second wife of James Adams, joined him in his mission work at Taegu, after the death of his wife, Nellie. When Caroline came home on furlough for reflection and interpretation of her ministry every seventh year, she needed a pace to stay. A gift from her family made possible the purchase of a court of seven cottages on Regent Street in Berkeley, the current site of the Berkeley Presbyterian Mission Homes. Subsequently, two large adjacent houses have been added to the property as well as a six unit apartment complex. Today, BPMH provides subsidized housing for international faith leaders who are pursuing advanced degrees at the Graduate Theological Union. The subsidy is offered at the highest rate (no more than 50-55% of market value) to students with F-1 visas who intend to return to their home country. In 2015, BPMH opened its doors to its first Muslim student, launching its new identity as intentional multifaith residential community. Programs promoting interfaith dialogue are part of the residential experience. 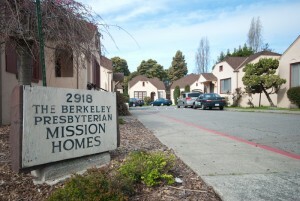 The Homes are administered by a Board of Directors, comprised of ecumenical volunteers from East Bay religious communities. The Board supports the work of the Executive Director who oversees Program, Administration and Buildings & Grounds. The Board meets every other month. Two resident night-managers cover facility issues in the evening hours and on weekends.